"I personally have not seen the play..."
Wow. If that official in the photo is the back judge (and I have no way to tell without seeing the whole field) he is egregiously out of position. That’s high school officiating mechanics. He should have released to go deep and should have been right on top of the play. That’s the reason he missed the call—he was 15 yards out of position and thus blocked from what we all saw as an obvious call. He should never officiate an NFL game again. There was an official five yards or so on the sideline staring face on at the players. 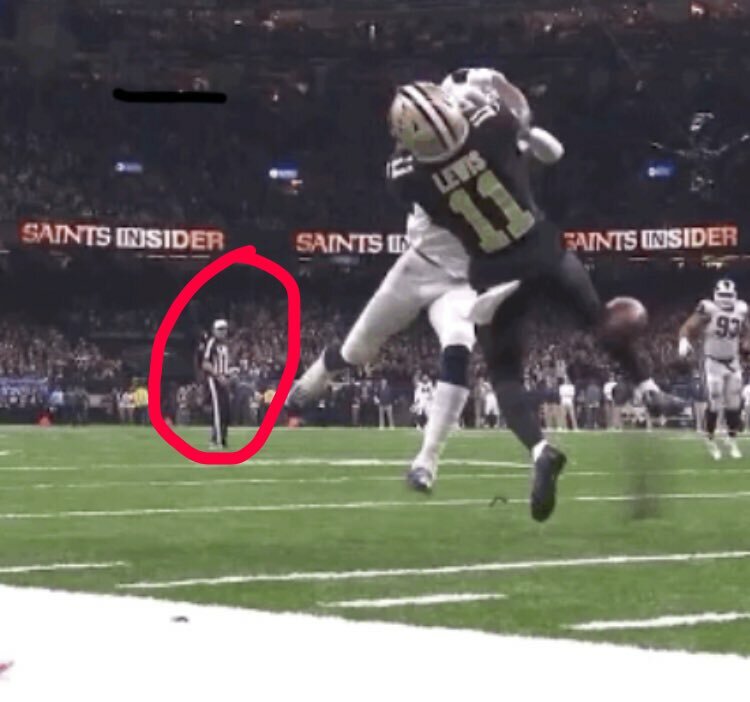 I think the picture above may be of the crew chief ref who said "I didn't see the play" or whatever the exact quote was. How would New Orleans feel if Goodell reversed the call? I think the picture above may be of the crew chief ref who said "I didn't see the play" or whatever the exact quote was. The exact quote is the quote above the picture - white hat denotes chief. I have decided that this year I will not be watching the super bowl. The Rams got in dishonestly; the defender admits that he purposely did what he did and knew it was an infraction, to his credit. The "helmet rule" was put in place to protect players from head injuries; the Saints lost their tight end when a defender's helmet crashed into his, and the concussion protocol was put in place (the refs saw that he was dazed; how do they think he got that way?). That is at least two helmet contacts that the refs decided did not warrant their calling on the defenders. I also cannot stand watching New England; they are the poster children on how to cheat and get away with it. They make Alabama look like the Vienna Boys' choir. Hallmark channel has the Puppy bowl; I would rather have that on. the Ref in question is now apparently saying the ball was "tipped" which is why there was no call. According to a Ram's player anyway. 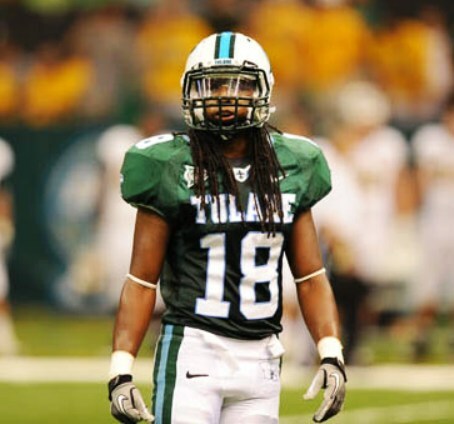 I suppose decade after decade of being a Tulane fan should have prepared me for what happened to the Saints. Someone mentioned the Miami fifth down - and also the idiot ref who said Banks didn't score when the whole world saw him score. And let's not forget the Iowa State so-called two-point conversion for the "win" where their RB was down at the two and slid into the end zone, and a game against Ole Miss where the timekeeper ran out the clock instead of stopping it for the chains to move after we made a first down deep in Ole Miss territory (Jeff Wenhold reception) and could have scored to take the lead, and the refs running out the clock on Tulane in the Memphis game when our ball carrier had clearly gone out of bounds, and another game against Ole Miss where they literally tackled our receivers multiple times when the ball was in the air with no PIs called (one of which resulted in a so-called interception after bouncing off our receiver who had been wrapped up and taken to the ground), and the Mississippi State game where their QB got up off his knees to run for what the refs let stand as the winning touchdown, and I could go on, but the point is that Tulane fans are uniquely qualified to sympathize with Saints diehards today. I can't think of a football fan base that has had to endure more inept and outright biased officiating than Tulane's. In general, and TUPF can speak to this better, on tipped balls the flag gets thrown and then picked up after a discussion. The issue of a tipped pass would affect the pass interference call, but it would not affect any helmet to helmet hit that the NFL had suggested occurred. Hill was knocked out with such a hit in the first half; the refs did not even think about how he got his bell rung as they sent him off the field. Ridiculous. The second largest media market won out. There is no issue concerning a tipped ball. The ball was not tipped. Yup, my disbelief got the best of me. The back judge does not wear white. That’s the referee and he is in the offensive backfield. The OT should have never happened. They call that as they should have and the game is OVER. EXACTLY! The Saints (with the penalty) get the ball first down and goal to go inside the 10, run the clock down as far as they can with running plays, and kick a GAME-WINNING FG. THERE WAS NO TIPPED ANYTHING. there was a video from WGNO that shows the referee standing on the goal line, 5 yards away just waving "incomplete" then rushing and gesturing violently at the trailing referee on the same sideline as if to say "don't throw it, not your call"
Regardless, I stand by my opinion that being aggressive there is not a bad idea.